Rhinoceros are being killed in South Africa alone at a rate exceeding three a day (1004 were killed and their horns stolen in 2013). This rampant poaching has already wiped out the Western Black Rhino in 2011, and threatens the remaining rhinoceros species in Africa and Asia with extinction. Why is this illegal trade in rhinoceros horn so lucrative? Exact prices are hard to gauge but a recent haul of illegal rhinoceros horn in Vietnam had a black market value of £80,000 per horn. That makes rhinoceros horn (kilo per kilo) more valuable than gold. Its no wonder that impoverished people, in poorly policed and highly corrupt regions of Africa see the “rhino” as a wild animal that wanders around freely in the bush with 15 kilograms of gold on its head. Factor in an increasingly affluent, but no more enlightened market in Asia and the criminal smuggling gangs, and its no wonder the rhinoceros looks likely to be hunted until extinction in just a few more years. In the Middle Eastern country of Yemen, rhinoceros horn continues to this day to be coveted by Muslim men, although imports were banned in 1982. The horn, whose luster increases with age, is used for the handles of curved daggers called “Jambiya,” which are presented to Yemeni boys at age 12. Jambiya are considered a sign of manhood and devotion to the Muslim religion (? ), and are used for personal defense. Yemeni men place great value on the dagger handles, which are commonly studded with jewels. In China, the ornamental use of rhino horn dates back to at least the 7th century AD. Over the centuries, rhinoceros horns have been carved into ceremonial cups, as well as buttons, belt buckles, hair pins, and paperweights. 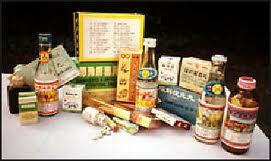 Far more pervasive and threatening, however, is the use of rhinoceros horn as an ingredient in the traditional medicine of many Asian countries to cure a variety of ailments (mostly in China, Vietnam and South Korea, although there is also significant trade and consumption in Malaysia, Laos, Burma, Indonesia and Japan. Even in so called developed countries like Singapore and Hong Kong). In traditional Chinese and Vietnamese medicine the horn is shaved or ground into a powder and dissolved in boiling water and mainly used to treat fever, rheumatism and gout. There are many other traditional Chinese medicines derived from sustainable and non-endangered plants, roots, minerals, fungi, and animal parts that are said to treat these ailments, as well as modern western medicines that have been proven to be effective. Science has evolved considerably over the last century and our belief in medieval superstitions and hocus-pocus magic has diminished among the better educated generations, but these superstitious beliefs are still quite pervasive in the underdeveloped world and especially in Asia. One must concede that some traditional or alternative medicine does have its place in maintaining health and well-being and can be effective in balancing yin and yang and conditions described by Chinese as “heatiness“. However rhinoceros horn should be off the menu. Not only is the efficacy of rhino horn as a medicine highly doubtful, but we all have a duty to protect this creature for the sake of future generations and for the maintenance of complex eco-systems that today are still not fully understood or comprehended. The vast majority of scientists (both east and west) and indeed the majority of “zhong yi” (Chinese medicine doctors) maintain rhinoceros horn consists of nothing more than keratin, the substance hair, toenails and animals hooves are made out of. Despite overwhelming evidence to the contrary, rhino horn is still coveted by superstitious Asians with more money than sense and it remains very difficult to change this medieval mindset. I once asked a Chinese businessman what he would think if he consumed parts from the very last tiger on the planet. He replied, “Very lucky”. There is no point arguing about ethics with xiang bao lao (bumpkins) like this who have increasingly large wallets, strongly held superstitions, and immodest desires to “show off their wealth” to their fellow peasants and family. 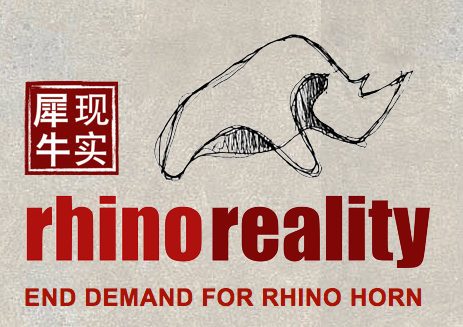 Therefore the responsibility lies with the governments of China and Vietnam, and the other Asian countries to enact stiff legislation prohibiting the possession, trade and trafficking of rhinoceros horn products and enforcing this law rigorously. On the supply side, there are people involved in South African wildlife tourism and conservation who are promoting extreme measures to curb poaching. One idea is to insert a poisoned rhino horn into the illegal trade — so that end consumers would fall ill and create fear in the market. Other ideas include data tagging horns so that the supply chains and markets can be identified, tracked and acted upon. 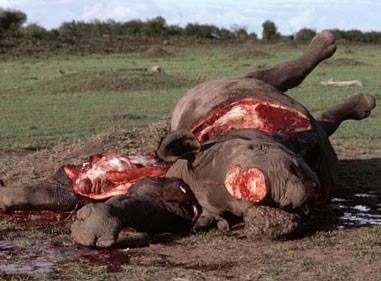 Another suggestion is to make some trade in rhino horn legal because unlike elephant ivory it is possible to take a rhino’s horn without killing the animal — although the poachers rarely leave their animal victims alive, or the animals die soon after from infection or blood loss. This idea is argued by economists to be counter productive as legal and illegal rhinoceros products would be hard to distinguish, and it would probably lead to greater demand and illegal trade in the market. In South Africa’s Kruger National Park, the military is now being deployed along the Mozambique border to stop the poachers and some western ex-special forces soldiers are now being employed in the game parks with a shoot to kill policy, and indeed several poachers have been shot in the Limpopo province parks and in the Kruger. This no nonsense approach is gaining favour in South Africa and other African countries and is likely to increase. For sure, a dead poacher is not going to poach again, but criminologists suggest that this is not the deterrent it appears to be as most criminals weigh up the chances of getting caught against the possible benefits, and desperate poverty and human greed will always result in desperate measures and increased risk taking. There is wide speculation and indeed reliable intelligence to suggest the proliferation in southern Africa of Chinese “R5” and discount shops that purport to sell cheap buckets, clothes pegs and the like, are in fact fronts for smuggling and other illegal activity. Many of these Chinese junk shops that have sprung up across Africa are heavily staffed with people from Fujian (mostly), Zhejiang, Guangdong and Guangxi provinces of China and are alleged to be in collusion with (or actually are) criminal gangs involved in elephant tusk, abalone, sharks fin, narcotics, gold, precious stone, timber, animal skin and rhino horn smuggling to China and Vietnam (two largest markets) and other Asian countires. Once, after speaking Mandarin with an elderly lady in one of these R5 shops in Worcester in the Western Province of South Africa I was later approached by a group of very agitated Chinese males who followed me and wanted to know in no uncertain terms what I was up to and whether I was involved in law enforcement. Of course, the average law enforcement officer in South Africa can barely speak English, let alone Chinese. With greater affluence and economic power throughout China, continued corruption and incompetence on the part of the South African authorities and its law enforcement bodies, and general disorganization and discord among the world’s environmental protection agencies the fate of the rhinoceros, and indeed other endangered species is very bleak. Dr. Brett Gardner, a veterinarian at Johannesburg Zoo, said: “We have to get rid of the trade in Asia. We’re wasting time and funds doing it here in Africa. Almost everyone involved in the fight against poaching says they can understand why a poor, unemployed man desperate to feed his family would be tempted into the illegal business, despite the possible consequences of getting arrested or even shot. Such is the desperation among many people in Africa. Some game reserves have said that they have been trying to educate their poorer neighbours that rhinoceros and elephant can attract tourism dollars over the long-term and that horn poaching can only be lucrative until the last rhino is killed. This is likely to fall on deaf ears as making a quick buck is far too attractive, especially given the day to day survival mentality and short time horizon that prevails across impoverished areas of Africa. Also, many game parks are more interested in protecting the more lucrative trophy hunting animals such as Kudu and Sable antelope. Rhinoceros and elephant do not have any commercial value and are just seen as a “nice to have” background Big 5 animals and so no real effort or investment is made to really protect them or properly investigate poaching activities and the smuggling syndicates. Its not just impoverished locals who turn to poaching, wildlife officials like Ken Maggs, head of poaching unit in Kruger, are very worried about the emergence of other more sophisticated poachers, apparently with money and backing behind them, who hire helicopters and gun down rhinos with high-powered rifles. The only viable solution is for each and everyone of us to lobby our government representatives and support campaigns for a total global ban, with very stiff and consistent sentencing on the consumption, possession, trade and trafficking of rhinoceros horn (and elephant tusk) where-ever it happens in the world. The governments and people of China, Vietnam, Yemen, South Korea, Malaysia, Cambodia, Indonesia, Japan, Burma and Laos must step up and start acting responsibly and do their bit to protect rhinoceros and other endangered flora and fauna. End the supply – End the demand. This entry was posted in Animals, KTM, Rhino, Uncategorized. 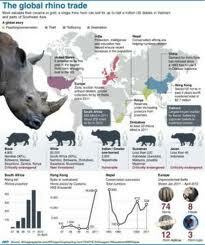 Tagged Africa, Chinese medicine, extinction, KTM, Rhino. this really saddens me and feel powerless. Just like the whale hunts and shake fin controversies…makes no sense to me to be honest.